Last summer was hot. One day when the kids were at home, we were all feeling hot and bothered. This is when Mr 4 came up with the perfect idea, we should make ice cream! It will cool us down and give us something to do. The kids were disappointed when I told them there was no way we could do this as we didn’t have an ice cream maker. But the more I thought about it, the more I considered, why didn’t we have one!? Even a cheap ice cream maker is a great idea for summertime – it allows you to experiment with flavours and it’s a great cooking task that kids can help contribute to. Since we bought the best ice cream maker we could find, homemade ice cream is a part of life, summer or not and along with our air fryer, it’s one of our most frequently used appliances. Click here to see the top ice cream maker now. But what is the best ice cream maker 2019 offers? 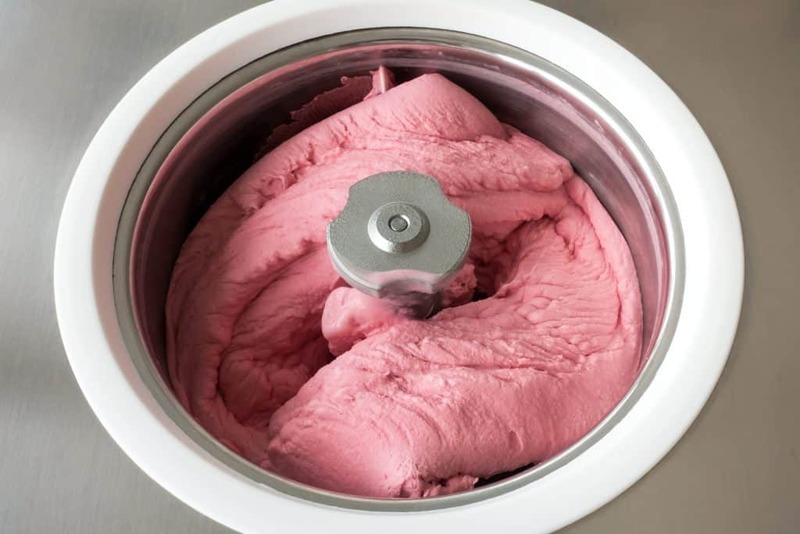 Below, we’ve listed what we think makes the top ice cream maker, as well as best ice cream maker reviews to help you find a top rated ice cream maker for your home. 2 Do You Need An Ice Cream Maker To Make Ice Cream? 3 How Does An Ice Cream Maker Work? 4 What Else Can You Do With An Ice Cream Maker? Want to know what is best ice cream maker to buy? Check out the top picks in the table below. We all love ice cream, no matter what the flavour, but do you really need to purchase an ice cream maker to enjoy a bowl of the frozen stuff? Well, yes and no. If you want to make ice cream the old-fashioned way, then no, it isn’t a true necessity, but if you want to save time, then purchasing a machine is a great way to enjoy your favourite sweet snack, in much less time. The best ice cream maker will create batches of your specific flavour and ice cream base quickly and easily, churning automatically, whereas the old-fashioned, manual way will take a lot of time and elbow grease. Do remember to check out ice cream maker reviews before you decide on the product you’re going to purchase. There are two main types of ice cream maker on the market, the automatic ones, and the ones which you use partly manually. We are going to concentrate mostly on the automatic variety because they are much easier to use. The best ice cream maker Australia option will certainly be an automatic type. Basically, ice cream makers use a compressor to force movement, in this case, a spinning action. This spinning combines the ingredients and makes the ice cream smooth and delicious. A cheap ice cream maker could be automatic, but it may also be one which you have to spin yourself, i.e. to make that smooth consistency that ice cream is so famous for. What Else Can You Do With An Ice Cream Maker? You certainly need to do your homework before purchasing an ice cream maker because not all actually make ice cream! The best ice cream maker on the market will make a mixture of frozen desserts, e.g. ice, ice cream, gelato, frozen yoghurt, whereas some of the cheaper models may just make ice creams. You need to check the small print before you opt for a particular product. You should also check online for the best ice cream recipe for ice cream maker too, because that way you can find out if you are able to make exactly what you want in the product you’re thinking of buying. Of course, there are certain things you need to look into before making your decision. The best home ice cream maker will not only do exactly what you want it to, but it will fit into your budget too. Here are a few things you need to look out for. Different ice cream makers have different capacities in terms of how many litres of ice cream they can produce at any one time. Machines with larger capacities are likely to be more expensive, but check out ice cream machine reviews below to be sure of exact capacities prior to your purchase. A cheaper model will make less ice cream, and you will need to do more batches. Some ice cream makers are self-cooling, which makes the whole process of making ice cream much easier than models that don’t have this extra feature. They are also known as compressor models. The best ice cream maker 2019 models will certainly have this feature. Those that don’t self-refrigerate will require you to put the contents you are creating into the fridge. Of course, some models will have extras which makes ice cream making easier. For instance, digital timers, digital screens, easy clean mechanisms, easily removable parts, self-refrigerating features as well as different mechanisms for ice cream churning so there’s less chance of forming ice crystals. Look out for any additional features that you might like when deciding on your final purchase. Also remember that the more features a product has, the more likely it is to be a little more expensive. What’s the best ice cream maker? Read the ice cream reviews below to find out. This may not be an instantly recognisable brand named product, but it is certainly one of the best automatic ice cream maker choices on our list. 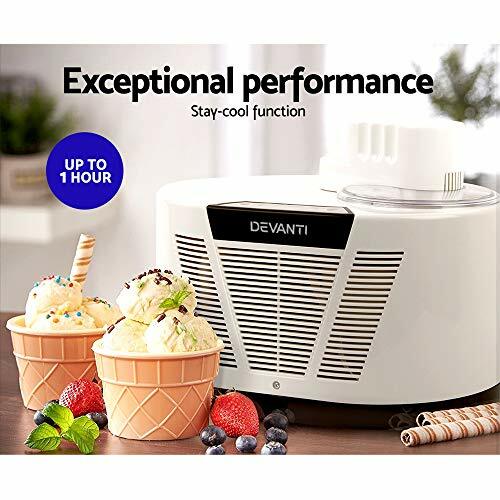 The ice cream maker has a 1-litre capacity, which is ideal for moderate use, and it can be used continuously, without a break, thanks to a high speed and high-quality compressor. There is a stay cool feature which work for up to 1 hour, and over freezing protection, which keeps your ice cream soft and delicious, without turning to ice. 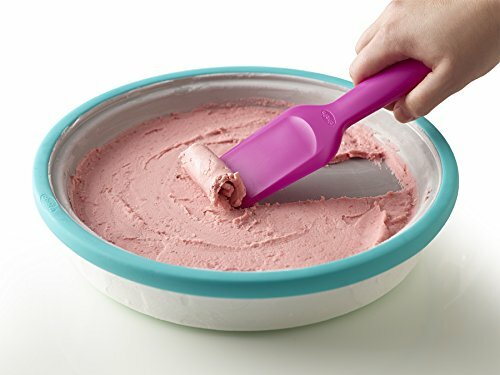 The product comes with a removable bowl, which is non-stick, a removable paddle for easy cleaning, and ice cream scoop. Additional features include an easy to read LCD temperature and timer display, with the timer working up to 1 hour. This is certainly one of the best cream ice cream maker choices on the market, and its 1-litre capacity is certainly enough for a full round of ice cream for all the family, and more than good enough to help you stop asking what’s the best electric ice cream maker out there. This Breville smart scoop ice cream maker best price option is ideal for those who want to create delicious, soft ice cream, and who also want the confidence of a big name brand. You only need to head online and check out Breville ice cream maker reviews to see how highly this product scores on a regular basis. This top rated ice cream maker has 12 hardness settings, so you can choose your preferred level of softness and the machine senses it from your settings throughout the process. There is also a pre-cool function on this machine which keeps your ice cream exactly how it needs to be. This top ice cream maker creates not only ice cream but also sorbet, gelato and frozen yoghurt, and you create these by simply choosing your setting on the easy to read display, and letting it do its thing! There is also a keep cool function which works for up to three hours. All of this and the machine is also super easy to clean, and more inline with a commercial ice cream maker. Another big named brand is Cusinart – a brand people think of when asking what’s the best ice cream maker brand. Ice cream maker reviews all rate this product very highly again. This is a very versatile machine as it not only makes delicious and soft ice cream but it can also produce frozen yoghurt and sorbet too. The capacity is 1.5 litres, so it is more than enough for a large family and you can also create frozen drinks too, such as slushies. The machine creates delicious snacks in just 25 minutes on average. If you want to add extra ingredients to your sorbet, drinks, or ice cream, there is also a large spout built into the machine – allowing you to add extras to your creations at just the right time. For larger families, or simply those who love ice cream, this Cuisinart option is a great one to go for. The cost might be slightly higher than some of the lesser known brand names, but the quality of the Cuisinart ice cream maker Australia really does speak for itself, and is comparable to the popular Whynter ice cream maker Australia. This is one of the best soft serve ice cream machine options on the market. It has a large 1.5 litre capacity too, so it is ideal for large families and ice cream lovers alike. This machine has a very strong and high-quality compressor, so it mixes ingredients to create high-quality ice cream. There is a built-in freezer within the machine, so there is no need to place the bowl into the freezer before use. The machine can also create frozen yoghurt and sorbet as well as ice cream. This is one of the best compressor ice cream maker choices, and it’s strong and durable construction means it will last the test of time, even if you use it on a regular basis. This means you are getting serious quality for your cash. The Apuro ice cream machine is one of the best ice cream freezer choices on the market to boot. This is one of the best gelato maker products around, and it is ideal for anyone who wants to create a larger amount of the delicious cold stuff, at 1.5 litres per usage. You can easily make not only ice cream, but yoghurt and sorbet too, and it takes around an hour for the process to be complete. This best rated ice cream maker is super easy to use, as you simply pour your ingredients into the bowl and then press only two buttons, then wait! This automatic option is, therefore, one of the most stress-free choices on our list, and there are different timer controls for each type of frozen snack you want to make. Your purchase will also include the bowl and paddle, and the whole machine is very easy to clean. The cost of this machine may put a few people off, as it is quite high in price, but the quality of the machine is something which cements its worth. The final best ice cream maker machine on our list is slightly different to the other ones we have reviewed so far. This is a more manual type of machine, whereas our others have been automatic. You don’t need electricity for this machine, which makes it great on your utility bills, and you can mix together your ingredients in less than 10 minutes, storing them in the freezer in the included bowl. This is one of the best homemade ice cream maker choices because it is so simple to use. There are no confusing controls or LED displays to think about – you simply combine your ingredients to create either frozen yoghurt, ice cream or gelato and store it in the freezer until you’re ready to eat it. The purchase comes with the stainless steel bowl, a spoon, and protective sleeve. You can then easily clean the contents with warm, soapy water, ready for your next use. The other plus point is the price, as this particular product is lower than many of the other choices we have reviewed. When asking what is the best ice cream maker on the market, it’s important to consider the range of budgets out there. Some people want to know which best buy ice cream maker is cheap, whilst others are happy to spend a little more. When it comes to the Hamilton Beach ice cream maker, ice cream makers reviews frequently mention this as a top quality (albeit expensive) product. The best part about the ice cream churner is that it doesn’t require salt to turn to ice cream. Operation is as simple as flicking a switch. In comparison to other machines in our ice cream maker reviews Australia offers, this particular model only takes 20 minutes to make ice cream as well as making a range of other desserts like custard and frozen yoghurt. It’s also the perfect soft serve ice cream machine for home use. If you’re looking for the best ice cream maker to buy, the best ice cream makers consumer reports frequently feature this as a top pick. If you’re stuck asking what is the best ice cream maker for the price, the AUCMA Ice-Cream Maker Machine is a super budget friendly option and the best ice cream maker to buy for cheap. Although it’s a budget option, it works as well as a professional ice cream maker, churning and preparing the best ice cream maker recipes in just 20 minutes. However, it doesn’t have a freeze option which means the ice cream can be softer than you might like. Something else we don’t frequently see in ice cream makers reviews at this price point is a LCD screen, which this particular model has. It also comes with a handy recipe book with some of the best ice cream maker recipes. If you’re on a budget, this is a great pick. Want to read more guides on appliances for the home? You can find them here.